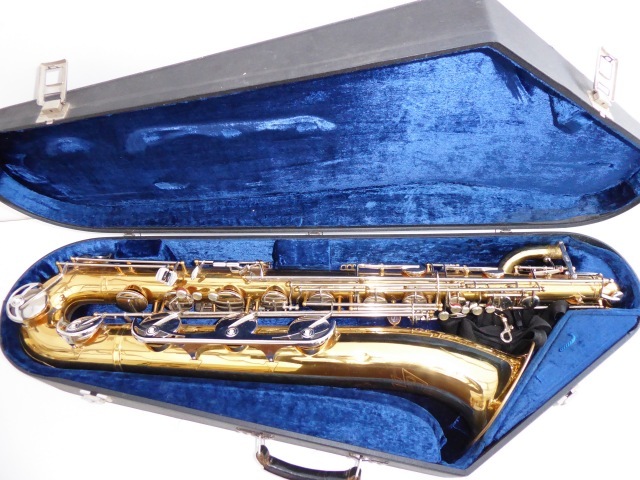 B & M Champion Baritone Sax with Low "A"
A rather nice looking Baritone Sax made by B & M and it is their Champion model. It has the benefit of a low “A”. There are no nasty dents, however there are a couple of small pings and dings in a couple of places but nothing much to worry about. The Lacquer is in very good condition. The pads are all fine and on the whole a very nice instrument. Great to play, has an easy blow to it. Serial no:- 1713 Comes with a hard case, strap, a decent mouthpiece along with a Ligature and Cap.